with the southeastern parts of Bangladesh experiencing a number of mild-to-moderate tremors since July 27, it is feared that a major earthquake is set to rock the region in the near future. Significantly, Bangladesh -- particularly the hill districts of Rangamati and Chittagong, adjoining Indian northeastern states -- is considered quake-prone as it lies along the border of the Eurasian and Indo-Australian plates (see map: In the danger zone). Yet the last serious jolt the area received was the Srimangal tremblor of 1918, which measured 7.6 on the Richter scale. From 1996 to July 2003, the Chittagong region abutting the Myanmar border has experienced more than 200 light and moderate earthquakes. Strangely, despite its vulnerability, local authorities have not been trained to handle such disasters. Seismologist Jahangir Alam reportedly lamented that though the area was classified as a high-risk zone for earthquakes, "we are totally unprepared". The recent spate of seismic activity has hit Barkal the hardest. On July 27, an earthquake of the magnitude of 5.1 left about 20 people injured in the town as several buildings cracked and some hills caved in. Barkal is a remote hill town in Rangamati, some 320 kilometres from Dhaka. It has a population of 40,000. 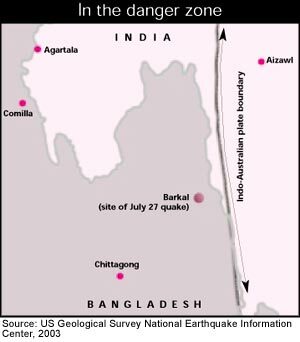 Geologists visited Barkal immediately after the first tremor and, apprehending it to be a precursor to a calamitous event, urged the Bangladesh government to relocate the local people. "Frequent small-intensity quakes portend a greater disaster," reveals Jahangir Hossain, coordinator, Earthquake Research Centre, Chittagong Engineering University. The warnings have so far failed to stir the administration into action, but many inhabitants have fled their homes and are camping on the grounds of a primary school. There are other impending dangers too. Sited in Kaptai town near Rangamati, the country's biggest dam and hydroelectric power plant runs the risk of collapsing as seismographs continue to record sub-soil tremors. A team of specialists from the Bangladesh Power Development Board is currently assessing the situation. Experts contend that if the structure has indeed been weakened by the quakes, it may burst rendering tens of thousands of families homeless. Besides, a crack has developed along a 10-kilometre (km) stretch of the hilly region making it vulnerable to landslides. Sporadic rainfall has heightened the threat. Even a medium-range tremor can now trigger landslides, feels Aftab Alam Khan, professor of geology at Dhaka University. Local people have also reported a 1-km crack in a riverbed in Barkal. It is believed that bubbles and strange odour emanating from the waterbody since the first set of tremors indicate the existence of a major fracture under it. This probably formed the earthquake's epicentre. To be sure, way back in 1993, Bangladesh had formulated a new set of national building codes in view of the country's susceptibility to quakes. Experts, however, point out that these guidelines have yet to be strictly implemented. "The ministry of housing and public works formed a committee in 1997 to develop a mechanism for their enforcement, but it did not make any progress," Jamilur Reza Chowdhury, convenor of Bangladesh Earthquake Society, a non-governmental forum, told Dhaka-based newspaper The Daily Star recently. Dhaka and Chittagong, the country's biggest cities, are likely to bear the brunt of any severe tremor because of their large population, old buildings, and poorly designed high-rise living and office complexes. Despite being forewarned, the country is nowhere near being forearmed. Its lone geophysical observatory in Chittagong can barely confirm that a quake has occurred. Even as a decision was taken sometime back to allocate us $4.3 million for upgrading the decades-old observatory and building three new ones, successive governments have sat on the plan. Early in August this year, Prime Minister (pm) Khaleda Zia asked the concerned departments to expedite matters, and also form a disaster management team comprising volunteers. She said the civil service, army, police, paramilitary troops and firefighters must be ready to respond to emergency calls and undertake immediate rescue and relief operations. More than a third of Bangladesh's 131 million population lives in vulnerable areas in the north, southeast and central parts of the country. Twenty-one people were killed in an earthquake in Chittagong city in 1997, while at least 10 died and over 100 were injured as a result of a tremor on the offshore island of Moheskhali in 1999. Bangladeshis have learnt to live with the devastating storms and floods that lash their country recurrently. But will they be able to withstand a major earthquake? The very thought leaves observers jittery.